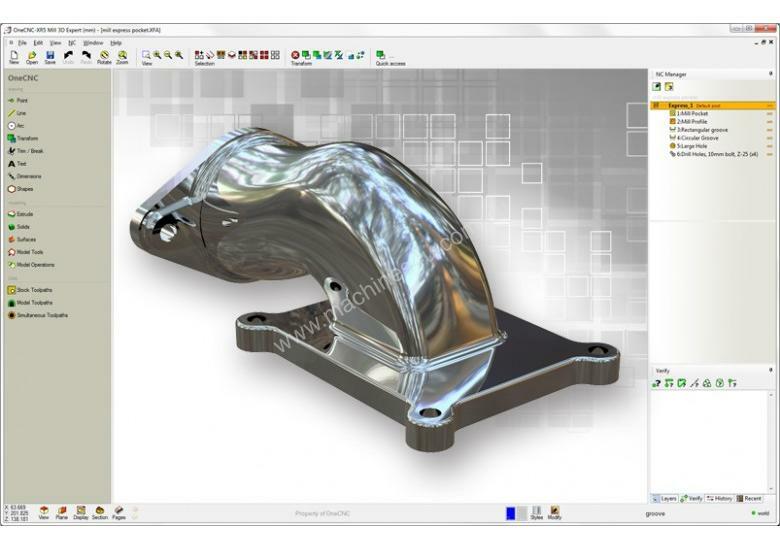 OneCNC Hybrid modelling provides a powerful, fully functional CAD system with a large number of dedicated tools for constructing surfaces solids and geometry. Solids can be created by extruding or cutting from geometry outlines, adding or subtracting simple solid shapes or by far more advanced techniques such as, sweeping, extruding and surfacing. Surfaces and solids can also be constructed from 2D drafting or 3D wire frame geometry. OneCNC has an extensive number of geometry surface and solids modification tools that can be applied to either existing geometry or imported models. Because OneCNC is one cohesive integrated system of surfaces solids and geometry it enables the simplicity of use. From automated geometry helper indicating end points tangencies intersections and arc centres all greatly assist in geometry construction. OneCNC provides automatic 2D drawing creation from 3D surface or solid models. Each view is meticulously created together with hidden detail ready for placement on the selected drawing sheet. Even an extensive 3D model the views can be created and placed on a sheet layout with minimal keystrokes and only takes minutes to complete. The 2D drawing including automatically created sections of the model can then be efficiently dimensioned and tolerance to complete the drawing. Drawings can be exported or printed from DWG, DXF, or PDF output.